The Boeing B-29 Superfortress was a four-engine propeller-driven heavy bomber that was flown by the United States Military during World War II, the Korean War, and by other nations afterwards. The B-29 was one of the largest aircraft to see service during World War II. A very advanced bomber for that time period, it included features such as a pressurized cabin, an electronic fire control system, turbosupercharged engines, and remote controlled machine-gun turrets. It was the primary aircraft in the American firebombing campaign against the Empire of Japan in the final months of World War II, and carried the atomic bombs that destroyed Hiroshima and Nagasaki. 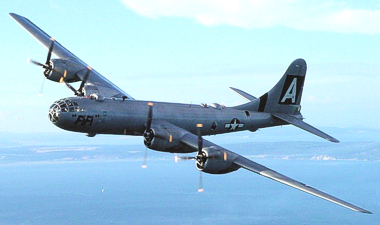 The B-29 remained in service long after the war ended, retiring in the early 1960s. 3,960 aircraft in all were built. The B-29 was capable of flight up to 40,000 feet (12,000 m), at speeds of up to 350 mph. This was its best defense, because Japanese fighters of that day could barely get that high, and few could catch the B-29, even if they were at altitude and waiting. Only the heaviest of anti-aircraft weapons could reach it, and since the Axis forces did not have proximity fuses, hitting or damaging the airplane from the ground in combat was next to impossible. The central fire control system used a highly advanced analog computer which corrected for the B-29's airspeed, the target's speed, target lead, gravity, temperature, barrel wear, and humidity. Because of this, the .50 caliber machine guns of the B-29 had a maximum effective range of 1,000 yards ( 910 m or nearly 1 kilometer ), which was double the range of the manually-aimed machine guns of its predecessor the B-17 Flying Fortress. During August of 1944, the pilot and crew of a B-29 flying a night mission over Sumatra reported that an intensely colored reddish orange sphere about 5 feet in diameter suddenly began pacing their plane. The pilot took evasive maneuvers, but the UFO stayed with the B-29 for about 8 minutes before making a sudden right angle turn and disappearing into the clouds above.